Diabetes and walking barefoot in summer – what are the risks? If you have diabetes, think twice before walking barefoot outdoors this summer. There are many potential risks for your feet. 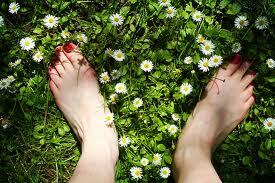 We all love walking barefoot in summer, don’t we? The soft cushion of grass or a sandy beach under our feet feels wonderful and the act of going without shoes makes us feel kind of bohemian. Walking barefoot is fine if we’re perfectly healthy. But for those suffering with Diabetic neuropathy, going barefoot can be downright dangerous. Diabetics who develop neuropathy lose sensation in their feet, which may start as an occasional tingling in the toes. When we walk barefoot, our feet will sometimes get small cuts and abrasions. No big deal if you’re healthy because you’ll notice the pain and will take care to treat it. But for those with Diabetic neuropathy, that cut or abrasion may go completely unnoticed and can lead to serious infection. A patient with Diabetic neuropathy also needs to be concerned with picking up an infection such as MRSA, which is much more difficult to treat than common staph infections. Even though MRSA is related to staph, it’s usually resistant to common antiobiotic treatment and requires a more aggressive approach. Why am I more susceptible to infections because I’m diabetic? Diabetes alone doesn’t make you more susceptible to infections. If and when you develop neuropathy and lose the feeling in your feet, you’re more likely to be unaware of a sore or ulceration on your foot, so it’s left untreated. This becomes an entry point and perfect breeding ground for bacteria, leading to infection. Always wear a sandal, athletic shoe or flip-flop to protect the bottoms of your feet. This is your first and best step in prevention and goes for walking indoors as well. The rule of thumb is, never walk barefoot! Inspect your feet every day, looking for redness, swelling, open sores, cuts, foul odor, etc. If you notice anything out of the ordinary, call your podiatrist immediately. When drying your feet, “pat’ each foot dry and be careful to gently dry in between your toes. The complete list of diabetic foot care tips can be found on the East Penn Foot and Ankle website. The Diabetic Foot and Ankle Center of the Lehigh Valley should be your first call if you have diabetes and notice anything out of the ordinary about your feet. Dr Teichman and his staff are expert at treating patients with neuropathy and they will create a preventative foot care plan for you to manage the devastating effects diabetes can have on your feet. I have lost some feeling sensation in six of my toes. I can feel pain if I pinch, bump, or scratch these toes, but what I can feel is vibrations through them. I’ve had an annoying warm pins and needles sensation for almost two years in my feet and lower legs. The annoyance comes and goes. It usually disappears when I do physical activity like walking and social dancing. It effects me more on the job than it does when I am home or engaged in recreation. A few weeks ago, at my work station, I took my shoes off. And within a few minutes the annoyance vanished. I now wear my work shoes loose so that I can slip in and out of them at a moments notice. What I want to know is what are the mechanics here. Why is my neuropathic pain relieved when my shoes are off? I just got state sponsored medical coverage. I went 4 years without access. Four years ago, my blood sugar levels were in the normal range, I was 25 lbs lighter, and I walked an average 50 miles a week. The toe that has the greatest loss of sensation has been this way for quite some time. I will admit I haven’t always purchased the best pair of shoes. The biggest problem I have with shoes is this: on one foot the arch length is 10.5 and on the other it is an 8, but the overall foot length is about an 8.5. The foot that has a 10.5 arch length is an 8.25 whereas the other is an 8.5. I usually get shoes that about an 9.5. Also, I have had bunions on both feet since I was a preteen. They are alot bigger now. My work shoes are SAS with a non-slip sole for kitchen workers. I did pay almost two hundred dollars for these shoes. These shoes are almost worn out, but I will not be able to afford another pair til june or july of this year. The problem with healthcare is money. If I were a full time worker the insurance might cover podiatry. I do know the state medicaid health plan I am on will not cover this (nor will it cover the doctor recomended vision test). If I had a diagnosis of type 2 diabetes it might. But as it stands, I don’t have a definite diagnosis of pre-diabetes, all I have is a random prick test where I scored 5.9 on the HBA1c scale. Therefore, I am SOL when it comes to getting the state to pay for alternative treatments (beyond diet) for the neuropathy or getting a podiatrist to properly fit shoes. William: Most medicaid plans cover podiatry services. Are you positive that yours does not?